Posted by Dr P. Senthil Kumar, National Geophysical Research Institute, Council of Scientific & Industrial Research, Hyderabad 500007, India. Gullies are well-known geomorphic features on Earth where they are mainly formed by erosion due to flow of liquid water. 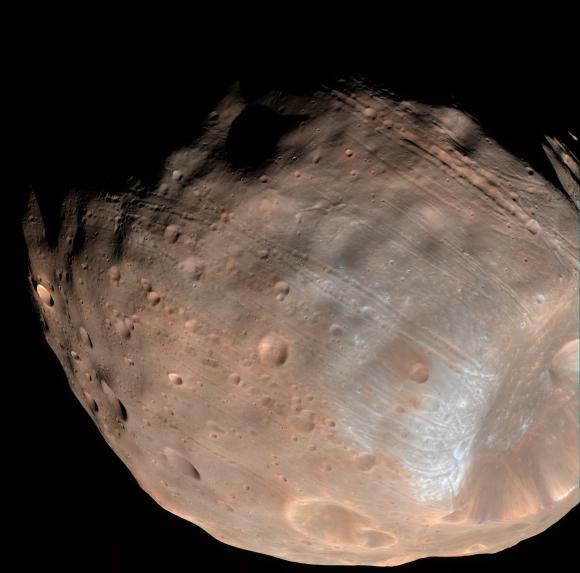 They are also detected on Mars and the Moon and their origin on those bodies are under discussion (Malin and Edgett, 2000; Senthil Kumar et al., 2010). The gullies consist of alcoves (erosional features), channels (features indicating transportation) and fans or debris aprons (depositional structures). These features are clearly observed on the interior walls of impact craters on Mars and widely on the mountain slopes of Earth. Hence, geomorphologists use these features to examine the characteristics of liquid water flow either in the present or past geological records. Image 1: (a) The Chandrayaan-1 terrain mapping camera image showing the ~7.2-km-diameter fresh crater (centred at 72º12’S, 133º12’E) emplaced in the peak-ring material of Schrödinger basin. The topographic profiles along A-A’ and B-B’ are shown in Figure 1d. A 6860-m-diameter circle fits perfectly to the crater rim from the western to the northern sides of the crater, while the crater rim recedes in other parts due to enhanced crater wall erosion. (b) The shadow-enhanced TMC image reveals the presence of arcuate ridge and the pond material on the crater floor. Note the pond is oriented toward the prominent landslide surface. (c) The TMC image showing the presence of concentric faults along the northwestern crater rim. (d) The topographic profiles along A-A’ and B-B’. The interior wall that contains the landslides (B-B’) is gentler and shallower than the interior wall with the gullies (A-A’). The ridge material is characterized by a higher topographic relief than the surrounding crater floor. The pond material has a flat surface that embays the ridge and other floor materials. See Senthil Kumar et al. (2013) for more details. 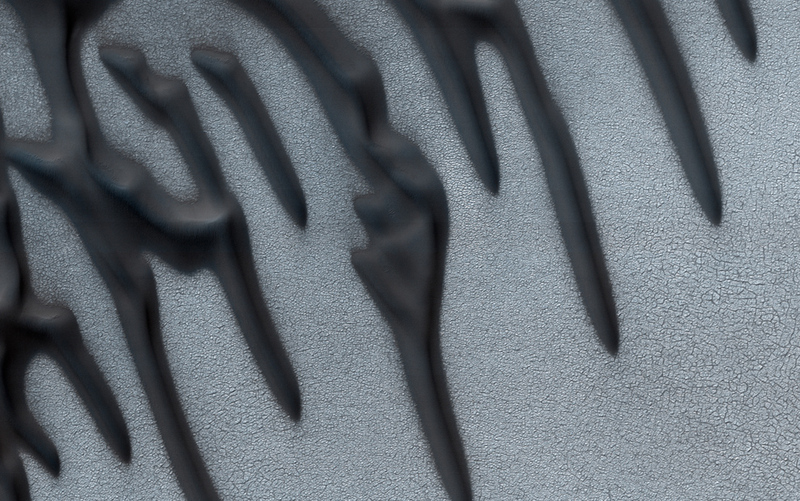 The gullies can also form by dry-granular flows, as seen in some locations on Mars (Treiman, 2003; Shinbrot et al., 2004). Indeed, the observation of gullies on the interior walls of lunar impact craters spurred new views about the origin of gullies (e.g., Bart, 2007). The recently concluded and on-going lunar missions (Chandrayaan-1 and Lunar Reconnaissance Orbiter) revolutionized our understanding of these landforms because of very high-resolution imaging techniques. Based on these new data, Senthil Kumar et al. (2013) have reported new observations of gullies and landslides on the Moon and proposed a mechanism for their formation. In their study, high-resolution images from Chandrayaan-1 Terrain Mapping Camera reveal landslides and gully formation on the interior wall of a 7 km-diameter simple crater emplaced in Schrödinger basin on the farside of the Moon (Image 1). These features occur on the steep upper crater wall, where the slope is ~35°. Image 2: The LROC NAC image M118979214L showing the detailed illustrations of the gullies from high-latitude regions of the Moon [Image credit: NASA/GSFC/Arizona State University]. A set of gullies originating from the upper wall, have typical alcove-channel-fan morphology; the materials eroded at the alcove regions are transported along the channels and deposited in the fan. Fan deposits also contain large fragments of rocks either removed from the alcoves or the channel walls. (b) Examples gullies and landslides from the low-latitude regions on the nearside of the Moon (LROC NAC image mosaics M157418698LR and M137848463LR). These gullies are found on the NNE wall of Dawes crater; the image is centred at 26º22′40″E, 17º29′36″N; (c) gullies and landslides on the SSE wall of Dawes crater; the image is centred at 26º25′05E, 16º56′05″N. See Senthil Kumar et al. (2013) for more details. Further examination of the Lunar Reconnaissance Orbiter Narrow Angle Camera (LRO NAC) images gullies show that the gullies are composed of typical alcove-channel-fan morphology, similar to those seen on the surface of Mars (Image 2a). Spectral characteristics inferred from data obtained by Hyperspectral Imager and Moon Mineralogy Mapper on board Chandrayaan-1 show that the gullies and landslides are devoid of prominent spectral absorption features related to water or hydroxyl molecules, suggesting they formed by dry-granular flow processes. In addition mass movements on the crater wall led to the formation of arcuate ridges and ponding of fine-grained sediments on the crater floor. Runout flows from small impact craters on the slopes indicate that impact-induced seismic shaking was responsible for the downslope mass movements, similar to those observed on the surface of asteroids (Robinson et al., 2001; Richardson et al., 2004). Crater size-frequency distributions indicate a minimum age of ~18–2 Ma for the gullies and ~2 Ma for the landslides, while age of the host crater ejecta was inferred to be ~175 Ma. The gullies and landslides are also found to occur on the interior wall of impact craters in the low-latitudes on the Moon and probably formed by similar processes (Images 2b and 2c). Bart, G. D. (2007), Comparison of small lunar landslides and Martian gullies, Icarus, 187, 417-421. Malin, M. C., and K. Edgett (2000), Evidence for recent groundwater seepage and surface runoff on Mars, Science, 288, 2330-2335. 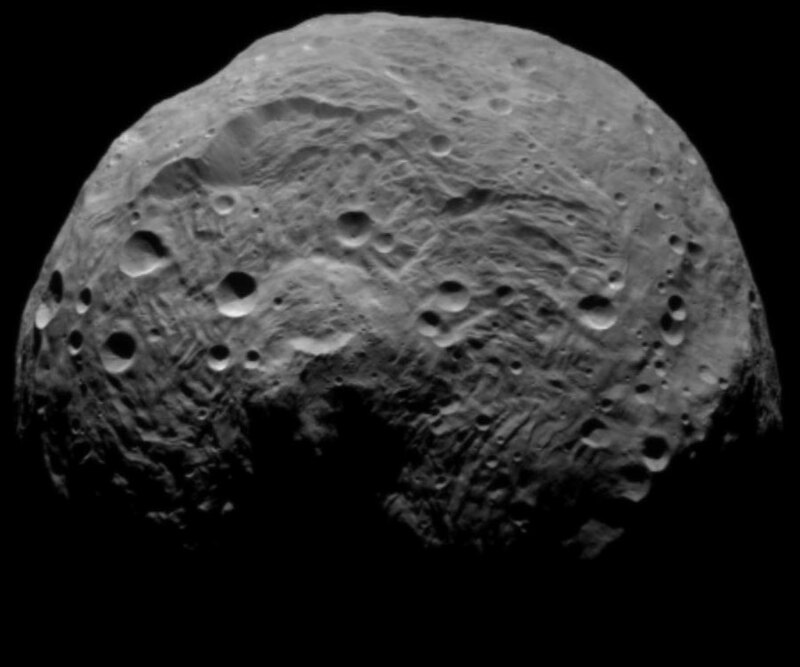 Richardson, J. E., H. J. Melosh, and R. Greenberg (2004), Impact-induced seismic activity on Asteroid 433 Eros: A surface modification process, Science, 306, 1526-1529. Robinson, M. S., P. C. Thomas, J. Veverka, S. Murchie, and B. Carcich (2001), The nature of ponded deposits on Eros, Nature, 413, 396-400. Senthil Kumar, P., J. W. Head and D. A. Kring (2010), Erosional modification and gully formation at Meteor Crater, Arizona: Insights into crater degradation processes on Mars, Icarus, 208, 608-620. 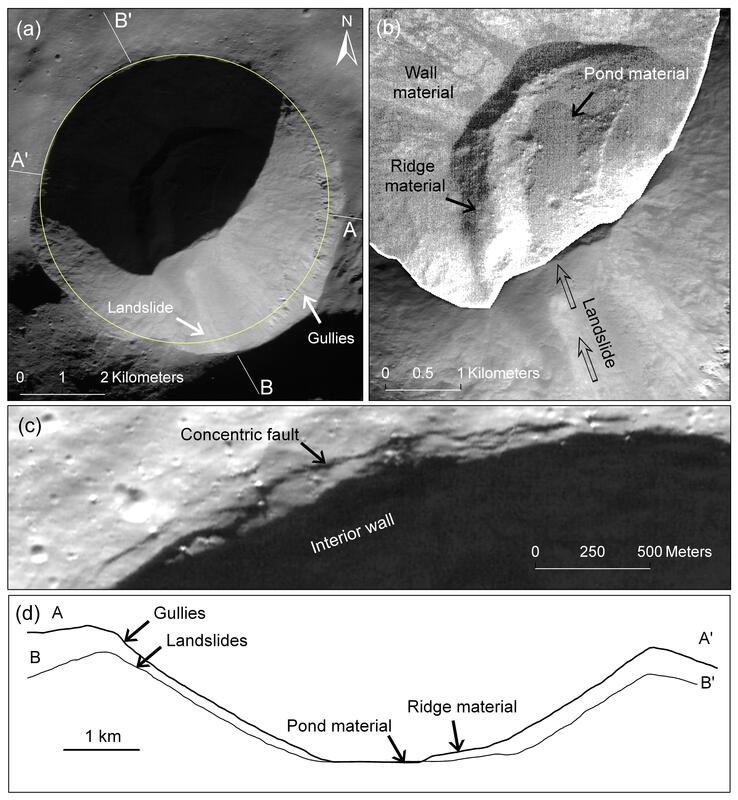 Senthil Kumar, P. , V. Keerthi , A. Senthil Kumar , J. Mustard , B. Gopala Krishna , Amitabh , L. R. Ostrach , D. A. Kring , A. S. Kiran Kumar , and J. N. Goswami ( 2013 ), Gullies and landslides on the Moon: Evidence for dry-granular flows , J. Geophys. Res. Planets , 118 , 206 – 223 , doi:10.1002/jgre.20043. 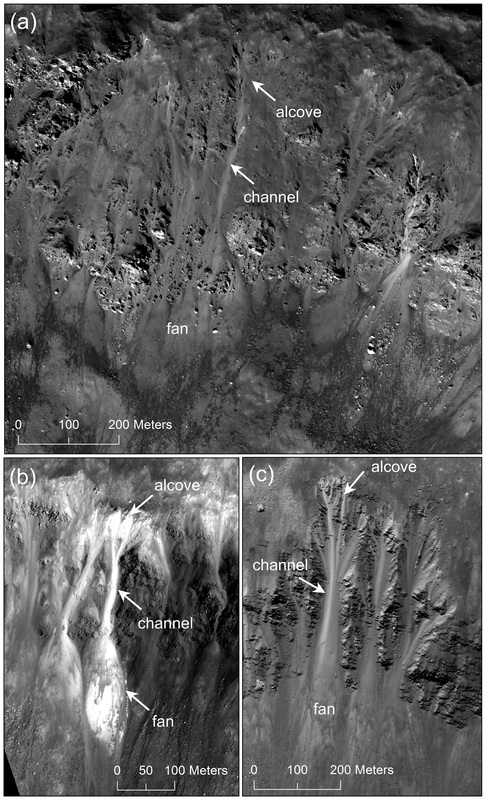 Shinbrot, T., N. -H. Duong, L. Kwan, and M. M. Alvarez (2004), Dry granular flows can generate surface features resembling those seen in Martian gullies, Proc. Natl. Acad. Sci., 101, 8542–8546. Treiman, A. H. (2003), Geological settings of Martian gullies: Implications for their origins, J. Geophys. Res. 108, No. E4, 8031, doi:10.1029/2002JE001900.